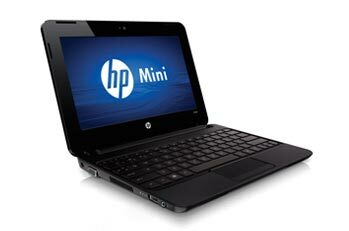 The HP Mini 110-3830NR is 10inch netbook that comes with your standard issue Intel Atom N455 processor. Clocking in at 1.66GHz, this single core Atom is coupled with 1GB of SDRAM. It has 250GB of SATA HDD storage with a platter speed of 5400RPM. It is meant for those who need basic computing in a small package and a smaller budget. 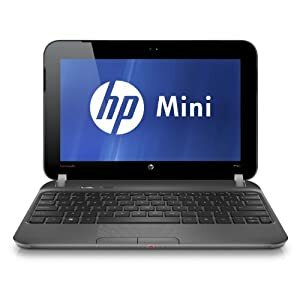 The HP Mini series is not as expansive as some of the other netbook lines like Asus’ Eee PC but it has very well developed models. This one specifically is a good-looking 10inch specimen that is all black all through. It sports a matte finish on the inside but the bezel is shiny. The lid has a plain black finish with the HP logo on top of it. It comes with a webcam that is settled top center on the bezel, in the de facto position for laptops/netbooks. The keyboard has island style keys and is laid out in way that makes use of every inch of available space on the netbook. Even though the size still makes it a bit cramped for prolonged typing, the layout and the keys make it comfortable to type on the 3820NR. The touchpad is set in to its own groove and is not fused with the rest of the palm rest area like some of the other netbooks. It has a matte surface that provides good traction for the fingertips. It has two separate click buttons. The netbook has a 10.1inch LED backlit display with a native resolution of 1024×600. It addition to that, it has an anti-glare coating to make it easier to work on for longer periods of time. Graphics is handled by an onboard Intel GMA chip with a shared memory. Enough to run all your standard definition videos and online streaming content. The 250GB storage that comes with the HP Mini 110-3830NR is enough for the average user to store a lot of documents, music, photos and some movies too. If you are looking to make it your only computer, then an external storage unit in addition to this should take care of your needs. Coming to connectivity, it comes with 802.11b/g/n Wireless, which includes Wireless N for super fast WiFi speeds wherever available. It has a standard 10/100 Ethernet port also for those who work on LAN. There’s no Bluetooth available but you can easily correct that with a small dongle that is available everywhere nowadays. 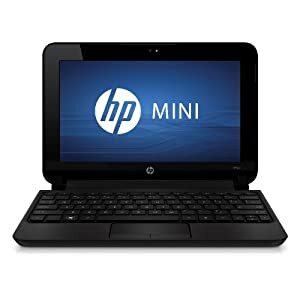 The HP Mini 110-3830NR comes preinstalled with Windows 7 Starter Edition, which is a cause for complaints from some buyers. It has restricted features in terms of customization but they can be remedied with some third party tools that are easily available online. Buyer reviews are mostly positive. Users love the affordability and the portability of the netbook. They also love how good it looks in black. Perfect for basic computing and Internet on the move.